heer terror. That is what prevented me from attempting to write a novel until I made it past the golden age of fifty. Although I had been a die-hard reader since childhood, a movie fanatic since what has seemed like fetal-hood and a would-be writer since the age of seven, I could never quite bring myself to take on the novel. Yes, I was well aware of the dramatic form, particularly after a thirty-year career in the theater as an actor and stage manager, and especially after watching what must be well above five thousand movies in theaters and on television during my half century of life. Surely I had more than a passing understanding of what it took to formulate a long, three-act literary piece complete with, as Aristotle advised: plot, character, meaning and spectacle. As much as I’ve been a man of ideas since back in the day, I could never wrap my mind around fulfilling an entire breakdown of chapters and scenes. It was simply too massive an order, and I was not confident enough in my abilities as a writer to believe that I could come up with that much step-by-step material. I had a recurring dream in college, circa 1977, that forever haunted me. It really had nothing to do with my actual life. I was part of an audience in an old-time, western sort of saloon. The crudeness of the wooden structure, as well as the abundance of hunting trophies and antlers adorning the walls, made me feel that the setting was more a northwestern than strictly ‘American western’ one. It reminded me of “Sergeant Preston of the Yukon”, which I believe was a TV show that was kicking around in reruns when I was very small. What this audience was viewing was a stage show presenting a line of “Can-Can” dancers like those beauties prevalent in the Parisian saloons of the mid-nineteenth century. There was all of the requisite hootin’ and hollerin’ and enjoyment of the young ladies kicking up their assets. The music abruptly came to a halt. A momentary pall fell over the crowd and I became certain in the pit of my stomach that something horrible and nightmarish was about to occur. That was when one of the dancers dropped out of the precision and, still on her feet, suddenly began writhing in agony and tearing at her clothing, as if her entire body was being consumed by unseen flames. 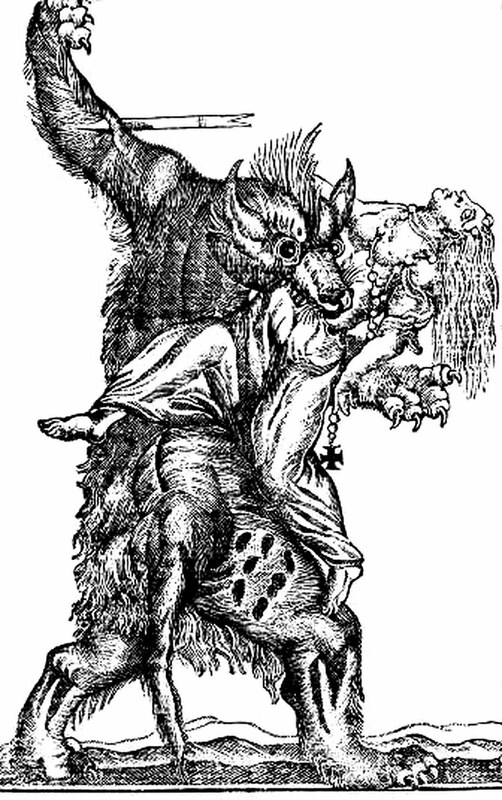 Before the horrified eyes of all present, the dancer turned rapidly into a werewolf. A muzzle stretched out from beneath her bonnet, sharp teeth rose from her jaws, and claws emerged from the tips of her fingers. A muscular frame miraculously developed under her ruffles and was instantly covered in fur. The crowd behaved as if they were in the path of a cyclone, and soon were clamoring for the exits, not caring whether their way was blocked by the falling bodies of others. I was terrified, as I was at once frightened that a panic was ensuing as well as experiencing the revelation that one of the mythical creatures of my fevered childhood was in fact real. And it was jumping from the stage and heading right toward me! Of course, before anything too definitive could occur I would always awaken, shuddering and unable to fall back to sleep for a good length of time. If we are killed in a dream do we really die? Besides the heart-pumping adrenaline of possibly being crushed to death by a mob or torn to bits by this monster of my own imaginings, there was that haunting image of the way the wolf emerged that always got to me. It was the jarring, Little Red Riding Hood nature of the transvestite, or should I say trans-specied mode of dress the demon chose to make his entrance in. It had always been an image that prowled the realm of childhood, hadn’t it? The face of that drool-slathering wolf surrounded by the soft and comforting nightgown and cap of harmless Granny. Anyway, that was the scenario that I couldn’t get out of my mind for years. Why had that dream come to me? It was obviously not an experience I had really had, yet it seemed so real and frightening. I was always grateful to awaken and find that I was not really partaking at that Yukon saloon, where a good number of people were about to become part of the menu. That tableau became the basis for a novel I wanted to write. I called it Loup-Garou, and imagined it to be about the harrowing experiences of a young American in Paris. I dreamed it to be the definitive re-emergence of the werewolf to popular culture, first in novel form and then on to glory as a screenplay. As a would-be writer right out of college, I had a number of fits and starts to what I was certain would be a sure winner in the entertainment marketplace. A few years later, it was. For a young man with a good deal more stick-to-it-iveness and meaningful contacts than me: John Landis came out with “An American Werewolf in London” in 1981 and seemed to be dragging the very sparks of my plan directly from my muddled brain. I don’t pretend to have been anywhere near completed with my idea or even to have had a notion of how to go about executing it at that time. More power to Mr. Landis, one of my all time favorites. But it is discouraging when this happens. What is that phenomenon, which has befallen so many of us creative types throughout our lives? Is it Jung’s “collective unconscious?” I sometimes believe that I have actually had precognitive visions of major themes that were going to sooner or later grab the imagination of the cultural zeitgeist. Be that as it may, it was enough to temporarily douse the dream of a particular New England lad. Another novel that I had put some serious thought and work into over the decades was to take place at the site of one of my early just-out-of-college jobs. It was a State School for adults with varying levels of mental handicaps and nowhere else to go. The staff and residents of this facility, where I worked for a couple of years as an entry level attendant, were mostly a bright and cheery lot who were a tremendous amount of fun to be around and work with. But the facility itself- the campus where I was stationed had been a century old hospital for what were originally labeled “Inebriates”- was a decrepit and creepy setting for a ghastly horror novel in the making. The old buildings were rife with rumors of haunting and tales of psychological agony and suffering. Just to walk around that campus at night under the ancient yellow streetlamps was enough to make one send out resumes with alacrity. The dormitory where I worked, aiding residents with their daily routines of eating, hygiene and recreation had once been the nurses’ quarters, and there was even a labyrinth of tunnels that could get those angels of mercy to their patients in a hurry, particularly during the snow and ice-blanketed winters in that part of Massachusetts. Well, the tunnels were still used to get the residents, who were not able-footed under the best conditions, back and forth from the dorms to the cafeteria in the main administrative building, which also doubled as their “school”. This was back in the early nineteen-eighties when such institutions still existed and were in decline. All such places have since been phased out, thankfully so. I have even walked around the old grounds and viewed the vine covered structures where once I plied my then-trade. Some of the facility is being turned into luxury condos, quite the irony when one considers the misery that once took place behind those walls. Anyway, the stark surroundings and intense circumstances of the work, (residents could be violent at times and require physical restraint, many were certainly unhygienic much of the time and challenging to be around) made for a MASH-like atmosphere of camaraderie and tomfoolery among the staff. Working long hours under strict policies for months on end, one began to get the sense that he was just as institutionalized as the residents he cared for. I daresay there was no lack of stress-reducing debauchery among the young staff members in those heady days at the tail end of the sexual revolution, before upwardly mobile greed and, eventually, AIDS set in. All of this always struck me as a great mix for a coming-of-age saga, and I had done extensive planning on the scenes and characters, many of course based on amalgams of real staff and residents- (who in all cases were more colorful and had more perfect names than any master of fiction could ever concoct). Flash forward thirty years (and multiple excuses as to why my writing career was continually put off) later, and here we are. I have been writing seriously as a business now for 6 years, and enjoying a modicum of professional success as I begin my struggle. It came to me as a flash from heaven on a woodsy walk in 2006 that I should combine these two long-standing notions: my historical French werewolf saga and my sexual-revolutionary coming of age opus. How on Earth do these two fit together? It will be for the reader to discover when they explore the final outcome. But for now, a whole lot of years and great deal of “building” writing confidence later, the first draft is in the can! 400 pages, 105,000 words of a century old pack of Canadian Loups-Garou menacing a Massachusetts Institution in 1979. Let the cutting and honing begin. « THE KEENING MAN goes digital.